Are New Montblancs Catering Mainly To Collectors? Its all what you can and cannot afford, taste or no taste. I certainly dont have that money to swing, and none of my friends are oil barons so I dont see any meyself. For the rest of us who arent super-rich, we are just the posers. I am a fountain pen user and MB definitely caters to me. I use a fountain pen every day, usually a Pilot Decimo when not in the office. I love my 146, my Sailor & my Pelikan Piccadilly. I do get comments, but I just love the feel in my hand and the flow of the ink. Just special. Now I am waiting on my first 149, which I bought used. I think all of the high end fountain pens are best bought second hand. Just crazy expensive and it’s plain fun to hunt them. I have been using fountain pens daily since middle school so 30+ years. Im business - you have to have a ballpoint though - forms, writing on the back of business cards and other non-fountain pen-friendly paper. However, notes in my notebook - almost always a vintage MB. Usually out of the office I have a Kaweco Sport in my pocket. And never let someone borrow your FP. Not to be snobbish, but they will tweak the nib! Haha. I do like seeing someones reaction when you say no. Purchased my first MB fountainpen in 1992 starting law at University (in Holland). I have been using a fountainpen (amongst them various MB's) daily since then. Always clipped to my shirt pocket. I work in tourism and real estate in the Caribbean. Usually wear shorts and a nice shirt. Love the surprise on people's faces when they see me pull out a fountainpen to take notes / sign. 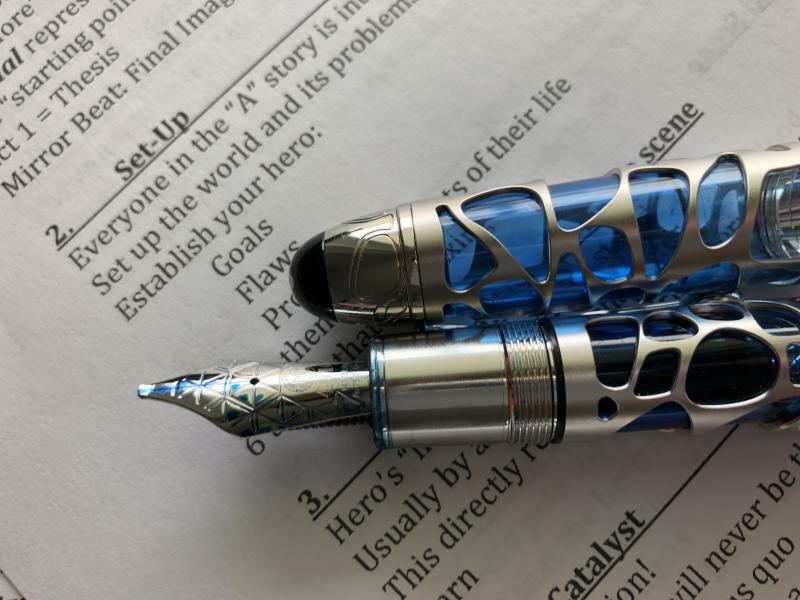 I have however never encountered anyone else using a fountainpen other than a handfull of professionals who keep a fountainpen on their desk mainly 'for show'. In regards to the OP, I don't think MB is catering mainly to collectors. That's why I believve they have been producing so many new models as of late, to try to reach the masses. With the special and limited editions, I couldn't say the same. I believe those models are geared for collectors. Fountain pens are like mechanical watches: obsolete relics of the machine age. As such, they appeal to niche groups and manufacturers cater to them. Status totems: for sure, and MB's marketing is at the pinnacle of this phenomenon. For actual users, the "Writers Editions" and other such "limited edition" items are near useless frivolities. On the other hand, vintage MBs, Parkers and others are beautiful and discrete. The few classics surviving in the MB lineup (e.g., the 149) are now grossly overpriced. I've used fountain pens for decades because I like the way they write. I replaced my 149 after it was "liberated" from my possession, but other than that, I stick to unobtrusive vintage fountain pens. I used to hang out with a bunch of Wallstreet types and most of them carry MB ballpoints. I have yet to see someone actually uses a MB fountain pen in real life. How many fountain pens period do you see being used in real life. Pretty far and few in between, at least in North America. In the last 5 years Ive seen only two fountain pens used in the wild. Both instances were Montblanc fountain pens used to take notes, and not just signatures. On another note, if MB were interested in producing fountain pens just to be looked at and not used, I highly doubt they would continue to offer 8 different std nib options from EF to OBB and everything in between, and equip every boutique with 146 tester pen sets so customers can sample each nib width before buying. They would just do the F and M nibs and call it a day. Edited by max dog, 02 February 2018 - 07:32.
max dog, as you say "On another note, if MB were interested in producing fountain pens just to be looked at and not used, I highly doubt they would continue to offer 8 different std nib options from EF to OBB and everything in between, and equip every boutique with 146 tester pen sets so customers can sample each nib width before buying. They would just do the F and M nibs and call it a day". But that is true, in general, of their "normal" pens, not their Limited Editions etc. I think that says a lot. The range of nibs is a very strong point in MBs favour, the inability to change them (until recently) is not. Back to the original question,I heard recently of someone who asked if they would get a free bottle of ink with their Limited Edition pen. The response from the Boutique was "what for?". That probably says it all! All the 'extra' MB nibs available in their range though are all in the broader end of the spectrum. Think signatures. The answer is, of course, an obvious and resounding yes. Their second customer is the one that looks for a fancy gift for a third party. But, also obviously, the "life-value" of a collector is much higher than that of the one that buys a pen for a third party once in a life-time. Just a hint: I challenge you to find just a single quote on the whole Montblanc website about how their pens write, or any single reference to characteristics that may be of interest for somebody wanting to write with their fountain pens. The bespoke nib program? The computer test that analyzes your handwriting to custom make a nib to your liking? The fact that they have nib options? Why would a collector care if its a M or EEF right? There is something very human about using a fountain pen.The cache' of an MB is double thunder. I googled the top ten pens of all time- Lamy 2000, Parker 51, 149, Pelikan 800-1000. They don't even make 51's anymore.Supposed to be the best pen of all time and they don't even make them? Anyway i've got a JFK149,Bernard Shaw 149, 2000 in black and stainless.Might get a Pelikan. So the accusation to me might be all the gear and no idea.Who cares? For me I dont think Montblanc is purely catering to the collector market . It can be argued that in recent years Montblanc have brought out a number of Bling pens but compare those with the number of other models Starwalker , cruise, Heritage, ect . Bringing a whole new user base to the brand . Care you provide a link within the Montblanc web site so we all can read about it, please? After having cheap ballpoints stolen off my desk when I worked outside my home, and a MB WE mangled by a visitor to the house (no longer invited), Im not about to leave a high end fountain pen where curious idiots can grab at them. Love the nibs and I dont particularly care what others think of my taste so long as Im happy. Given their inability to competently service a writing instrument, at least here in the U.S., I would agree with you. In the company's mind these are show pieces and no longer writing instruments. After my experiences of the past year with I will only purchase older MBs going forward and have them serviced elsewhere when needed. Sorry to break it to you, but it seems that Hamburg is not an option either: in the last 30 days I had 2 brand new pens go to them for nib exchange (149 and St Exupery), both came back mistreated and damaged (badly scratched and, in the case of the St Exupery, also chipped). The St. Exupery is on the way back to them, I just hope they fix it correctly. Edited by Lam1, 02 February 2018 - 21:57.